Fairs, sporting events, religious gatherings- many great events are gatherings of crowds. Parades can entertain, church gatherings can inspire, New Year’s Eves around the globe cause us to reflect and look forward to the future. But all of these crowded events have a significant danger brimming just under the surface. We often think about stampedes when thinking of crowd injuries, but crowd crushes can be much more deadly on a larger scale. What are the Dangers of Crowds? Crowded places present all kinds of dangers. Petty crime, becoming lost, and trampling just to name a few. Trampling is common during disasters where crowds are running away, but crowd events can be even more dangerous. When the density of a crowd reaches certain points, it behaves less like a group of individuals and more like a fluid. 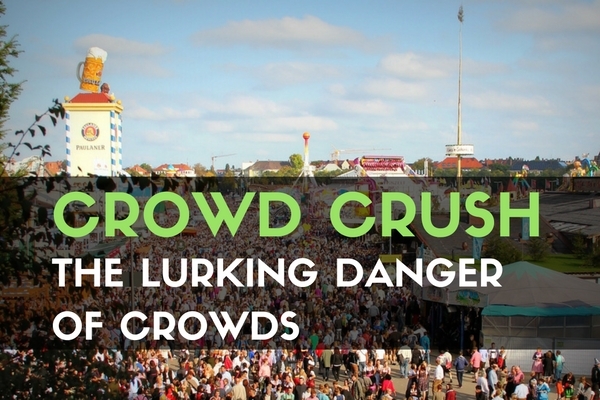 This can cause ‘crowd crush’ and ‘crowd collapse’- both extremely dangerous phenomenons. As recently as 2015 over 2000 people were killed in a single event due to the effects of a crowd crush. What’s the Difference Between Stampedes and Crushes? While crushes are often mistakenly called stampedes, they are very different phenomenons. Human stampedes simply cannot occur at higher crowd densities, and rarely occur at all. If a person has enough room to run and trample somebody, that person has room to get out of the way. Fires and other disasters have caused stampedes, but injuries from human stampedes are typically non-lethal trampling and contact injuries. Crowds become more dangerous at higher densities. A density of just four people in a square meter starts to become dangerous, regardless of size. 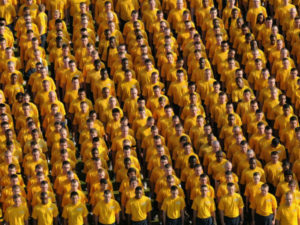 At six to eight people in a square meter, crowds behave more like fluid than individual people. At this density, a person cannot move individually and is subject to the forces around them. One push or force at that density can send shock waves, like ripples through a pool through a crowd. At higher densities, people can no longer lift their arms. At even higher densities, people find it difficult to breathe. The people subjected to forces at higher densities can exhale, but are not able to inhale with the pressure on their bodies. Crowd crush is common when people are trying to get to a certain area and pushing people in front of them. Black Friday sales, fires, and other disasters are examples of where people have been crushed in a crowd standing up. Experts call people pushing on other people in a crowd to get somewhere a ‘craze’. Choke points also prove problematic for moving crowds. They increase the density of a moving crowd by funneling them into tighter spaces and can provide walls that people can be crushed against. Choke points and crowd crush are why public area doors have to open outward and crash bars are required on emergency exits. Crowd collapse occurs when someone falls during crowd crush. When a void appears in a crowd crush, more people will fall down since they were leaning on the first person that fell. This domino effect is very dangerous, as people in the ‘pile’ will suffer from the weight of those that are pushed on top of them. The people at the bottom of the pile suffocate from compression. Progressive crowd collapse can also occur if the crowd is moving through a choke point, but then into an open area. The pressure of the crowd can push you forward into an open area and cause you to fall. Everyone behind the person that fell can then fall forward, all becoming trapped on top of each other. How Can Crowd Injuries be Prevented? Compartmentalizing can also be huge in preventing problems with crowds. For many gatherings they place waist high barriers to separate standing people for this reason. Think of it as turning a bowl of water into an ice tray- any people putting pressure in one compartment cannot push on the other compartments. Crowd management strategies also include feedback and communication. Many times, when people in a crowd are exerting pressure, they do not realize that they are possibly crushing somebody far away in the crowd. Police or authorities can direct crowds with loudspeakers and provide feedback to avoid these situations. 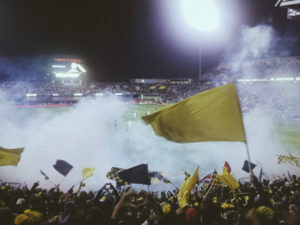 Computer models have been developed to help analyze crowds and predict when a high density crowd could possibly form and become dangerous. If you ever find yourself becoming a victim of crowd collapse and cannot escape, try to curl up into a fetal position and shield your head with your arms, creating a pocket for you to breathe. 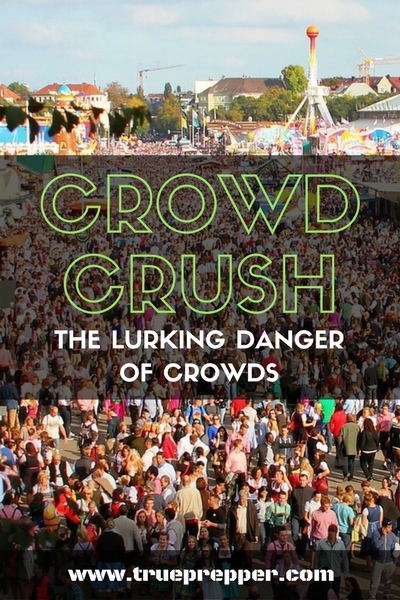 There are numerous examples every year of tragedies involving crowd crush. 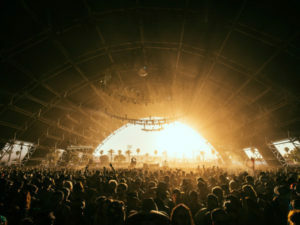 Whether a religious gathering or an entertainment event, it is important to know that higher density crowds can turn deadly quickly, and do so every year. 242 people died in Brazil during a 2013 nightclub fire. The crowd was much too large for the number of emergency exits which ended up as choke points. 12 young girls died from crowd crush while trying to escape a building during an earthquake in Afghanistan in 2015. 1,426 people died during the Hajj pilgrimage in Saudi Arabia in 1990. In 2015 another 2,262 people died on the same pilgrimage. It is the deadliest recurring crowd event and is much more dangerous than the running of the bulls. Check out the video below for the large crowd with high density to see why so many people die so often. From an aerial view, the crowd looks like ants on an anthill. Unfortunately, humans do not communicate in crowds like ants and are less resilient to pressure. While you may not be planning on hanging around large, very dense crowds anytime soon- large crowds can find you. Whether a fire in an office or a wide scale regional emergency, you could find yourself subject to crowd dangers. Escaping buildings often creates choke points where people can die from crowd crush or crowd collapse. FEMA (Federal Emergency Management Agency) points of dispersal for medicine distribution would draw large crowds that pack in tight during a pandemic response. Using situational awareness is important when things could get out of hand because avoiding these crowd situations is the best plan of action. Get prepared and stay safe.